Woodrow Wear is a company that was created in 2009 by a dog owner whose senior dog - Woodrow - was having a hard time getting around the house due to canine arthritis and hip dysplasia. Woodrow Wear is dedicated to the millions of older dogs that have traction and mobility issues. 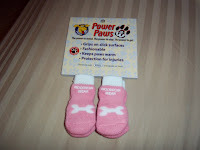 The main product created by Woodrow Wear is Power Paws dog socks. These no-slip socks with a bottom grip help senior dogs from sliding on slippery floors and gives them traction to get around. It also works great for any dog as paw protection for wounds or from hot or cold surfaces and also protects your floors from scratches. Not only that - they are fashionable too! 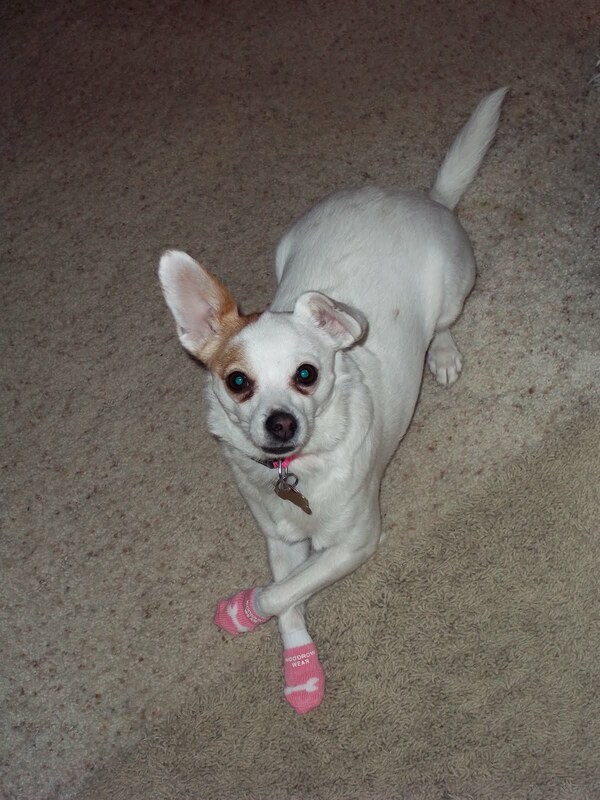 My dog Dotty recently got the chance to try out Power Paws for herself. 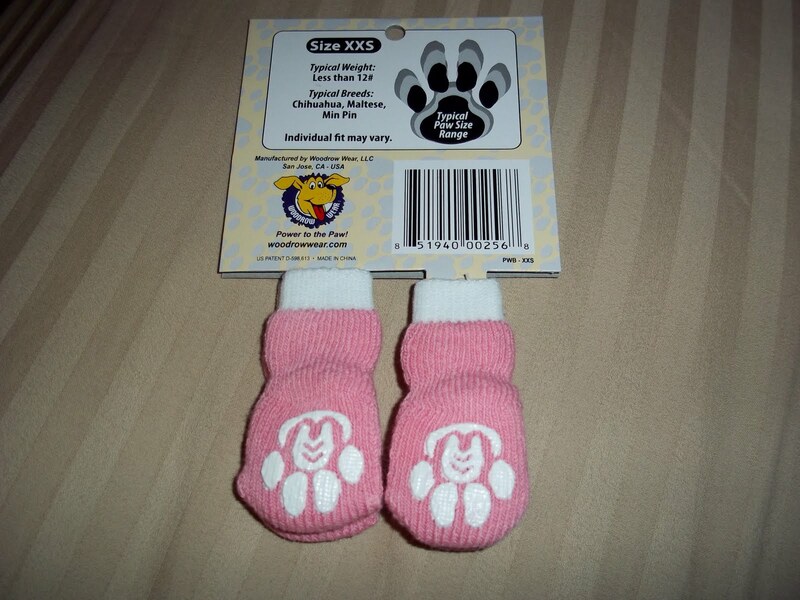 I picked out the XXS pink socks with a white bone on the top of each sock and white paw-shaped grips on the bottom. They are so cute! 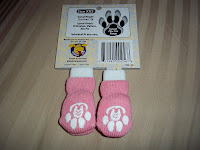 The set includes 4 socks, and the size chart on the website really helped me find the right fit for Dotty. I love the fact that these dog socks are easy to get on and off - they stretch to fit and don't require any velcro or fasteners, plus they are machine washable which is great since they will inevitably get dirty! Dotty walked a little funny when I first put them on her since she wasn't used to wearing anything on her paws, but she soon got used to it and was running around in no time! I especially love that these prevent scratches, as Dotty often accidentally scratches up people's arms or legs when she's trying to get attention or jumping up on someone's lap. Her small nails can really be a nuisance, so when company comes over or when she's around my baby niece, these Power Paws will really be a great solution! I also plan to use these dog socks in the winter for outdoor use (after spraying them with waterproof spray as advised) so that Dotty can go out in the ice and snow without trying to hop on one leg like she often does when she has to go out during the winter! 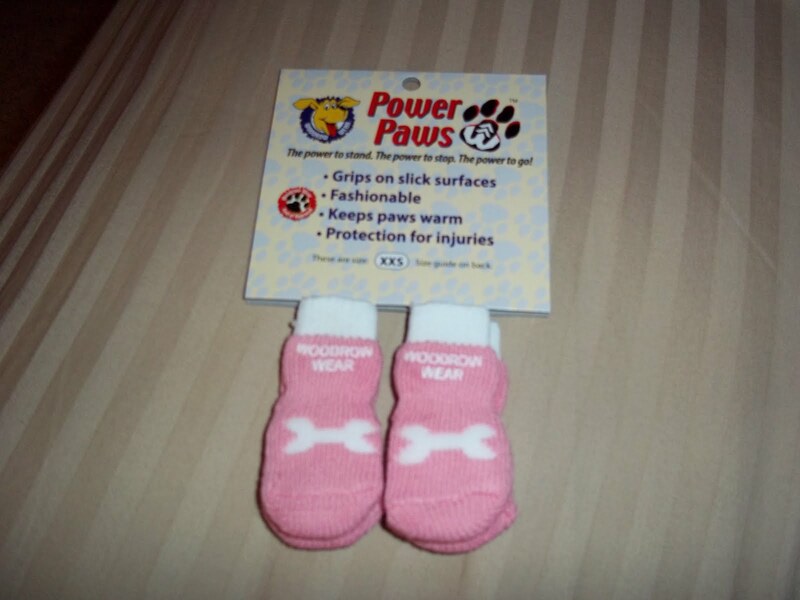 Her little paws get cold easily, so Power Paws are a great solution to keeping her warm in cold months. Plus, they will also work for keeping her paws clean in these muddy spring months so that instead of having to wipe her feet or give her a bath after playing outside, I can just take off her socks and wash them in the machine! I am very impressed with the quality of Power Paws and think that they are a great idea for function and fashion for your four-legged friend! in your choice of style and size! Mandatory Entry: Follow Woodrow Wear via Facebook OR Twitter, and leave a comment on this post telling me you did so. Please leave a separate comment for each entry & include your email address. Contest Details: Giveaway will end on Wednesday, April 27. US residents only. Winner will be drawn via random number generator Random.org. Winner will be contacted by email and will have 48 hours to reply before a new winner is chosen.